European Business Club Poland Association – Organization open for everyone, who cares about promotion of business, enterpreneurship, economy, science, culture and sports. EBC Poland publication for the year 2018 is available in an electronic version. We welcome you and wish you a pleasant reading! 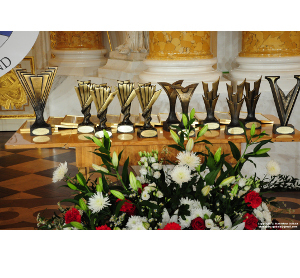 European Business Club Poland Gala Awards Ceremony 2018. EBC Poland publications are available in an electronic version. We welcome you and wish you a pleasant reading! Oliwia Szydłowska – three times world junior champion in sport dance. I would like to welcome you on behalf of the Association of European Business Club Poland. We are a nationwide economic organization created at the initiative of Polish entrepreneurs bringing together representatives of business, science, culture, diplomacy and sport. The purpose of our organization is to promote the development of entrepreneurship, economy, science, culture and sport. The mission of our Association is to make the economy active in all aspects that may affect the economic condition of enterprises and support the process of European economic integration. We are a Club of people who have attained professional success, with the ambition to actively participate in inspiring and shaping the development of economic activities and creating better conditions for its management. An integral part of our program is to promote ethics in business. We support actions aiming at improvement of managerial qualifications and skills. In pursuing our statutory objectives we co-operate with domestic and foreign economic organizations. We provide a forum to establish business co-operation, discussion of issues which trouble Polish and European economy, exchange of economic, scientific and legislative information. We are guided by the principles of mutual respect and support for the comprehensive development of companies that are members of our Club. We promote companies and enterprising people who have achieved success at home and abroad by awarding them prizes and distinctions of our Club. From members of our organization we expect co-operation in the building of prestige, power and high position of our environment in Poland and abroad. We invite you to co-operation, under the banner of entrepreneurship and social responsibility.